I've learned to love layer cakes because it's easy to do when you bake it in one pan. The trick is just cutting the cake to size and stacking them together between a filling. In this case, a sweetened cranberry sauce kissed with oranges matched beautifully with a orange cake made with orange extract, orange zest and orange juice. 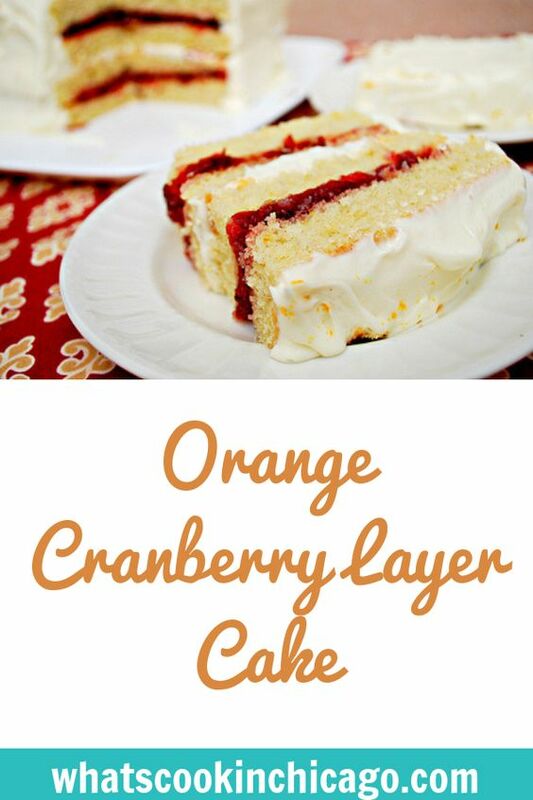 This is a perfect dessert to bring to the holiday table that you can decorate with fresh berries and orange slices as a garnish too! In a medium saucepan set over medium high heat, add the cranberries, sugar and orange juice. Cook for 7-10 minutes, stirring occasionally until the berries have popped and the sauce is thickened. Remove from heat and allow to cool completely. As the cranberry sauce cools, heat the oven to 375F. Line a 10 x 15 inch baking sheet or jelly roll pan with parchment paper; set aside. In a mixing bowl of a stand mixer fitted with a paddle attachment, cream the butter and sugar until light and fluffy. Scrape the sides of the bowl and one by one, add the 3 eggs followed by the orange extract, orange zest and orange juice. Add the baking powder and salt to the bowl and slowly fold in the flour alternately with the milk. Transfer the batter onto the prepared baking pan. Use an offset spatula to smooth surface and ensure the batter is an even depth. Bake for about 15-20 minutes, rotating half-way through baking, until the center is firm when touched. Allow cake to cool for 5 minutes in pan set on a wire rack. Flip the cake onto a wire rack then immediately re-flip back onto a second wire rack. The cake should be resting with the parchment side down. Allow the cake to cool for another 30 minutes . Transfer the cooled cake onto a cutting board and cut into equal halves cross-wise. Cut length-wise so that you have 4 equal pieces, measuring about 6″x 8″ each. While the cake is cooking, toast your pecans and chop them coarsely. Cut your cream cheese into 12 equal-size pieces, but keep it refrigerated until you are ready to use in step 3. Add the butter, sugar, buttermilk powder, vanilla extract and salt to the bowl of a standing mixer. Mix using the paddle attachment on low-speed for 2 minutes; scrape down the bowl as necessary.Increase mixer speed to medium-low, then add cream cheese one piece at a time. Mix for 2 minutes until the frosting is smooth. Put the first of the cake pieces on your serving plate. Use a spatula to spread half of cranberry sauce over layer. Top with another cake piece. Use a spatula to spread 2/3-cup of frosting over layer. Top with another cake piece. Use a spatula to spread remaining half of cranberry sauce over layer. Top with final cake piece. Use a spatula to spread 1 cup of frosting over layer. Frost the sides of the cake with your remaining frosting. 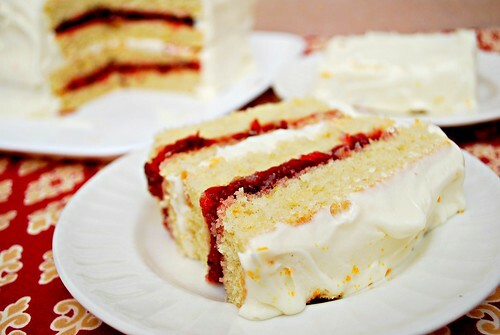 To garnish, sprinkle top of cake with orange zest before serving. Whisk together the above flours and store in an air tight container. To use, measure out 140 grams for every cup called for in your favorite baking recipe (NOT yeast bread recipes.) Add 1/2 teaspoon xanthan gum for every cup used in the recipe as well to help with texture and binding. This cake sounds so heavenly I must bake it this weekend! Thanks for sharing Joelen! Is the orange juice used thawed frozen concentrated and not mixed with water or orange juice w/ water added? Kathe, I would use orange juice that is ready to drink or fresh squeezed. If you are using frozen concentrated, prepare as directed on the package to serve as a drink and measure out for the recipe.